None of that ever happened …the closest I’ve come to any of this fantasy is attending/speaking at “hacker” conferences, finding a bunch of bugs, and writing mostly lame software and exploits. I did all of that amidst the hyper-focused software quality assurance that ostentatiously calls itself “computer security research”. But still, the dream lingered like a dusty raisin swept underneath the refrigerator in some derelict apartment. I would occasionally read about stuff like elaborate custom atm skimmer hardware, Nintendo DSi hacking, iPhonehardware jailbreaks, automobile computer hacks, smart-meter fiascos or see presentations by Barnaby Jack or Travis Goodspeed and my chin would quiver with envy as I fought back tears of regret…”Man, I’d always wanted to do *that* kind of stuff…”…ok not really. On a pentest project a few years ago, I was tasked with attacking a network infrastructure that supported a series of wireless sensors. The project was overwhelming because I’d never done any professional “results-oriented” hardware reversing or penetration testing. However, in a few short weeks, armed with Python (pyserial), a dilettante’s google-knowledge of serial taps, two days of soldering parts from Fry’s, and some basic protocol reversing/replication we had some great findings with code injection through a blackbox telemetry sensor into to the infrastructure’s backend…..All from a serial cable. This success taught me a lot: mostly that a little bit of knowledge of hardware can go a long way for a software reverse engineer and vulnerability researcher especially now that many of the most interesting targets are implemented on embedded systems. 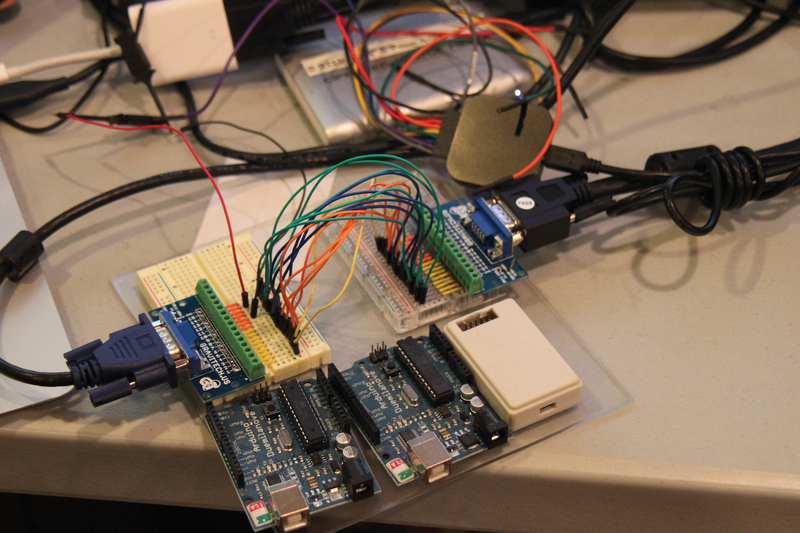 Over the last few years I’d collected a number of Arduino development boards from SparkFun. These (like so much other crap I’ve accumulated over the years) were destined to become re-gifted stocking stuffers…that is until I started reading one day about the simple serial protocol common in embedded controllers and integrated circuits. Most of these protocols were so simple that they only required two wires (some only requiring one!). Of all the above, the ones that piqued my interest most were how EEPROM, HDMI/VGA, and Microcontrollers used this serial protocol. To start, very first thing I wanted to learn was how to tap these busses to begin observing them in “the wild”. I needed to perfect my methods for blindly approaching a piece of hardware. I needed to know how to go from knowing nothing about a hardware target to determining of any tappable busses were exposed. The resulting techniques and notes (along with hardware used) turned into a presentation given at SummerCon (in New York) in the summer of 2011 and ReCon Reverse Engineering Conference 2011 (in Montreal, Canada). Additionally, while developing and practicing these techniques I briefly assisted Charlie Miller on a project he was privately researching that resulted in his talk at BlackHat 2011 on reverse engineering MacBook batteries. My assistance with his project is noted in his talk and whitepaper. If you want a more detailed walkthrough please check out the video of the recon talk available here and embedded below. Slides are also available here. Thanks for this post and this talk! I’ve been wanting to pick up hardware hacking for a long time as well. I did manage to pick up a NerdKit and make it through a project or two, but the jump from software to hardware can be a difficult thing to wrap your mind around. The two have some things in common, but they still feel like entirely different fields. Very cool and interesting stuff. Thanks for this!! Great vid, great article. Not a lot of comments here, but it has over 2000 ‘saves’ on delicious.com! Thanks man, I had no idea because I don’t use delicious. I’m literally mesmerized, its a lot to take in, but has definitely helped me reach a better vision of the “big picture” in electronics; how software and hardware actually intersect (compared to what I learned years ago about the OSI model). Very inspiring, going to have to re-watch this a few times to let it sink in. You sir are a genius thanks for posting this! A new Course: "Software Exploitation via Hardware Exploitation"